When I tell people that, upon completion of my PhD program this summer, I plan to enter into a Masters of Public Health (MPH) program, they tend to think I'm a few crayons short of a fun box. "But you already have a Master's degree!" "But you've been in school for over ten years!" "But you..." you get the idea. And I can't say I entirely blame these people. It does sound absurd for Sam Hyde, B.S., M.S. and (soon) PhD to go on and do one more year of school, especially while I'm still so sick. (Guess whose blood counts did a nose-dive this week again? I'll be traveling to Accepted Student Day with, basically, less than 20% of the lowest normal range of platelets. This is not a lot of fun). So why am I doing it? After three college degrees completed without student loans, why am I taking on student debt to go to an Ivy League school for one more degree? Why am I (yet again) moving to a place where I know very few people, leaving my friends, church and everything I know behind to go to school again? Simple. 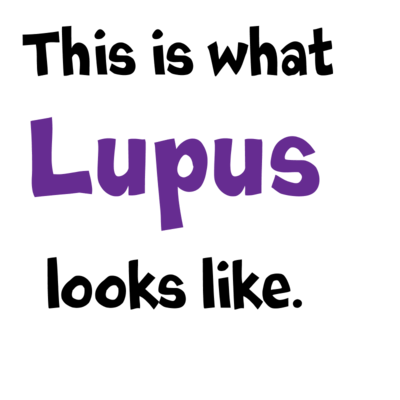 Because I a) have been extraordinarily blessed in my life thus far and b) I know that most lupus patients haven't been. I've managed to work my way through grad school, teaching and researching, to the point where I have a solid grasp of the science behind my disease, the drugs used to treat it, the tests used to diagnose it, etc. Most patients don't have that luxury. I am a religious woman (Episcopalian, and proud of it, if you're curious), much to the puzzlement of many around me. I do believe in God, and I do believe He has reasons for what He does. Maybe the reason I have lupus is so that I can use my education to help other patients. Or maybe not, I really don't know. But I do know that I am uniquely placed in that I have lupus, so I know what the disease really is, and I am a scientist. An MPH will allow me to take the science I've learned, and use it to impact policy, patient education, health management, etc. It will put me, a lupus patient, in a position to bring to the attention of policy makers, etc. just how awful this disease is, and how low little information most patients have available to them. This blog has been a starting ground for my public health work, as has my work as Resident Geek at LH/LV. I want to thank all of the other lupus patients who patiently waited as I relearned how to write in English after having written in Science for so long. I want to thank you for your questions, your kind comments, and your encouragements. Why am I going to yet another year of school? For you, for me, and for a better future for us all. I generally think of religion as a deeply personal issue, and don't like to wave it about. But I do feel strongly that God wants me to put my experiences (both medical and scientific) in the service of others. I have no question about that, and will act to do so as long as I can. After that, it's up to Him. But so far I've been able to do all of my degrees with ITP, fibromyalgia and lupus, so there's no reason to think I can't bear one more year of school. Go, go Sam. Wishing you continued success and fewer crappy health concerns. Take care. I have lupus and lupus nephritis. My husband has his masters in psych, MBA and a drph. I've done the prednisone drips, cell Cept etc. have you heard of gluthothion drip and Meyers pack to help alleviate symptoms of lupus? My husband's co worker with Lupus swears by them.